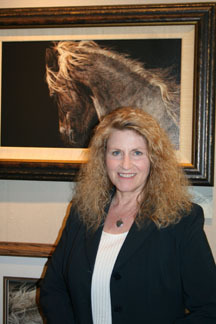 Judy Larson scratchboard art of horses and wolves conceals hidden images. Each hair is scratched out with a knife blade, revealing the white beneath. This demanding art form requires months of painstaking labor for each new painting. 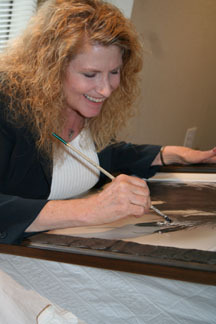 Judy Larson was surrounded by artists as a child, and was particularly inspired by her father, a professional illustrator. After receiving a Bachelor of Science degree in Commercial Art from Pacific Union College in Northern California, Judy Larson then spent the next 17 years as a commercial artist, illustrator and art director. In 1988, influenced by her love of nature and animals, Judy devoted her time to wildlife art. Her primary focus in each of her paintings is the animal, with the horse and wolf as a recurring subject. Larson uses a clay-coated, Masonite backed art board called Claybord®. To produce an original drawing, she paints the subject solidly with black India ink to create a silhouette. Larson then scratches away the dried ink using hundreds of X-Acto® blades and the result is a magnificent, lifelike image. Once the subject has been totally scratched, it is a finished black and white illustration, ready for Larson to add color. Larson prefers a combination of airbrush, gouache or acrylics for adding rich layers of color, with frequent rescratching for detail. The time-consuming art of scratchboard is unparalleled in its detail, allowing Judy Larson’s seamless concealment of imagery within her subject. For Judy Larson, whose underlying message is always passionately ecological, her medium of scratchboard, as well as her "art of concealment," allows her "to take the viewer with me." Explains Larson, "My desire is to engage viewers on three levels: first, by revealing the beauty of animals through intricate detail; second, by concealing a hidden image that draws the viewer to examine the painting more closely and through which I can tell a story; and third, by promoting a deeper awareness of the environment on a level that will hopefully have an impact." Larson is extremely passionate about her love of wildlife and supports a number of environmental endeavors. Larson is a member of the Society of Animal Artists. She lives and works in California.